A San Diego news team is ok after being attacked last night. 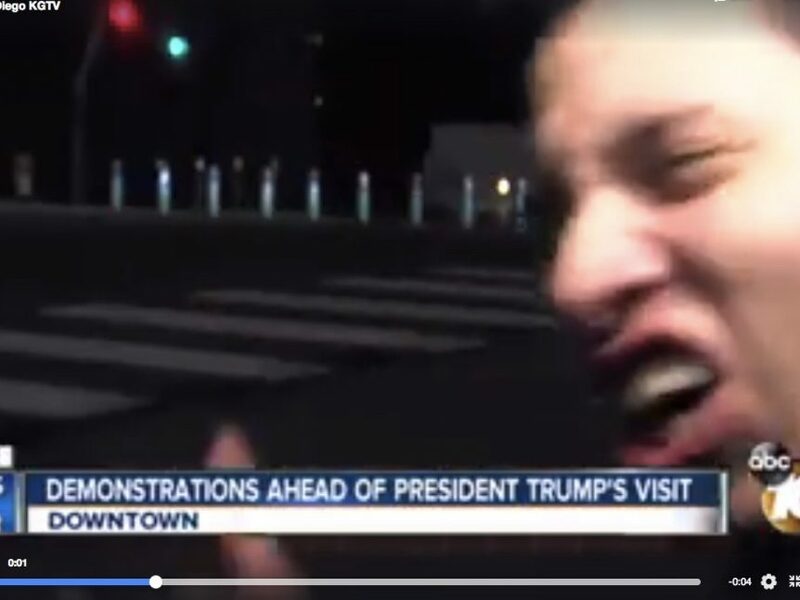 KGTV reporter Bree Steffen was doing a live shot previewing President Trump’s visit to the area during Monday’s 11pm show. During her live hit a man ran up to her and her videographer Mike Gold. You see her dart off camera mid-sentence and the unknown man screaming. The camera was knocked over and the station’s director immediately went back to the desk where Kimberly Hunt told viewers they had someone rushing to the scene. It is unclear what the man’s motive was in this incident but the story has shaken up the local news community. Steffen tweeted last night that she’s fine despite some bumps and bruises. “To everyone watching @10News at 11pm, my photographer @10newsGold and I are fine! Camera is broken and my wrist hurts, but everyone is ok,” she said. This incident brings up bad memories for TV news crews who were badly shaken after a WDBJ reporter and videographer were shot and killed during a morning live shot in 2015. You can watch the video of the attack below.